You are, of course, completely free to choose the hardness of the leg/upper and it is subject entirely to your personal experiences, needs and wishes. If, however, you are not sure which hardness is the right one for you, we will advise you personally and in detail. You again have a choice of colour from our full range. We use only genuine lambskin - which guarantees more durability than woven fur. 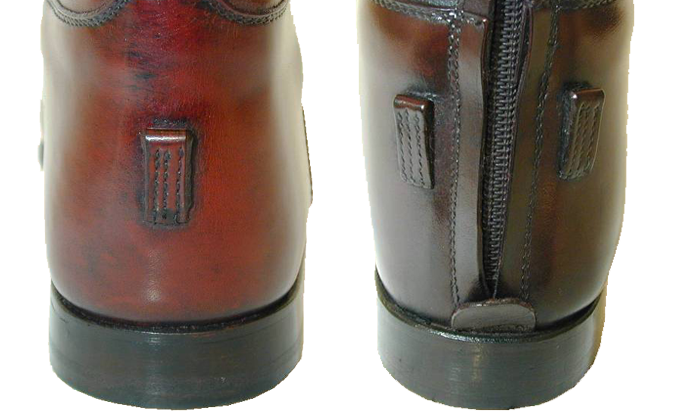 The complete inner of our bootees and half-boots is lined with lambskin. In our boots you have the choice of whether you want to have the complete inner lined with lambskin, or only the outer side. 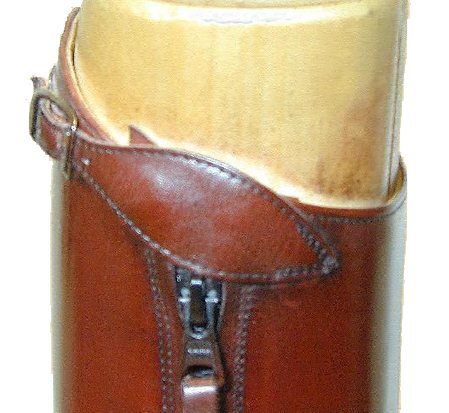 If only the outside of the leg is lined with lambskin, you have the advantage of having considerably more contact with the horse. 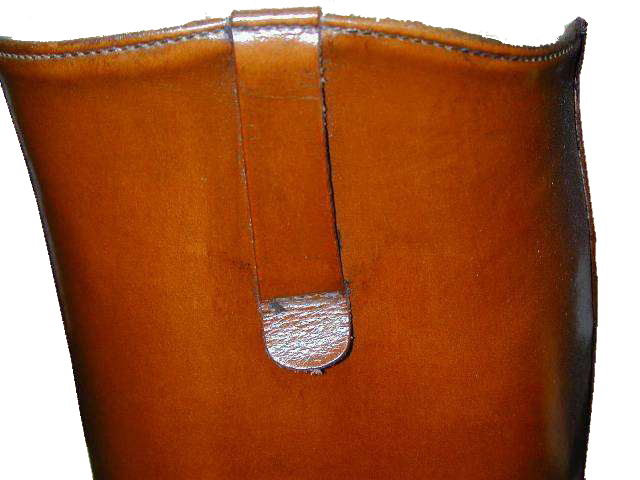 The foot part of the lambskin lined boot is always lined completely with lambskin. 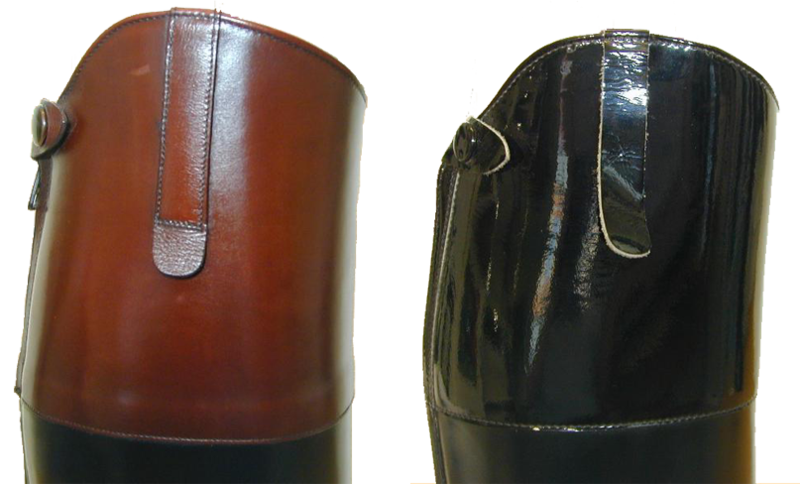 We can put zips into all boots, bootees or half-boots, if you so wish. 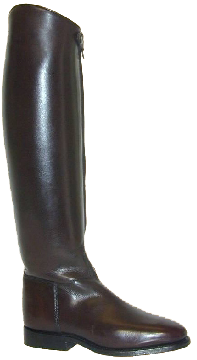 Full length rear zip In the show jumping boot, we recommend a full length rear zip. 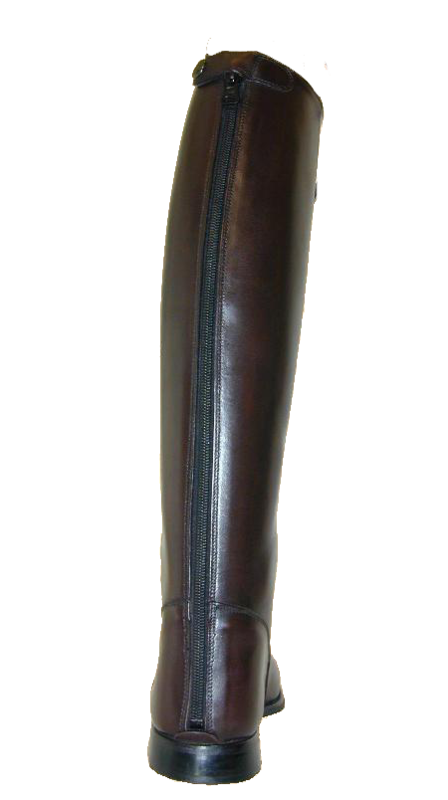 For the dressage bootwe recommend afull length zip at the front inside, next to the shinbone,, because it is not visible from the outside, has the longest life-span and also makes it easier to put the boot on, especially if the leg is relatively hard. 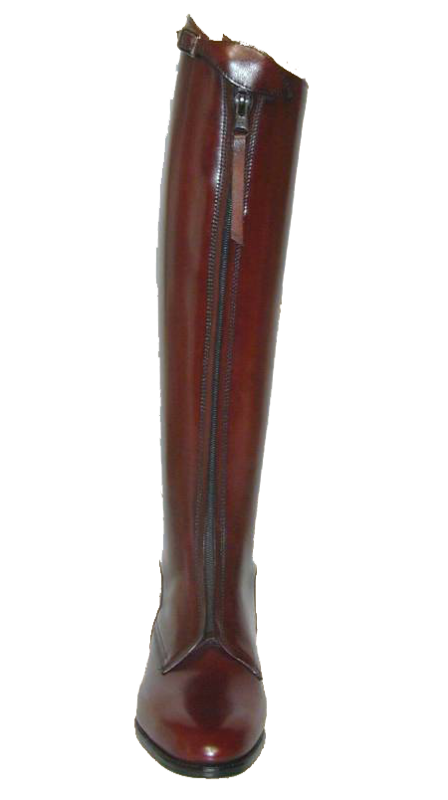 Front zip A zip at the front on the instep, up to the knee, is the mark of a polo boot, it can also certainly be chosen for a leisure or hunting boot. 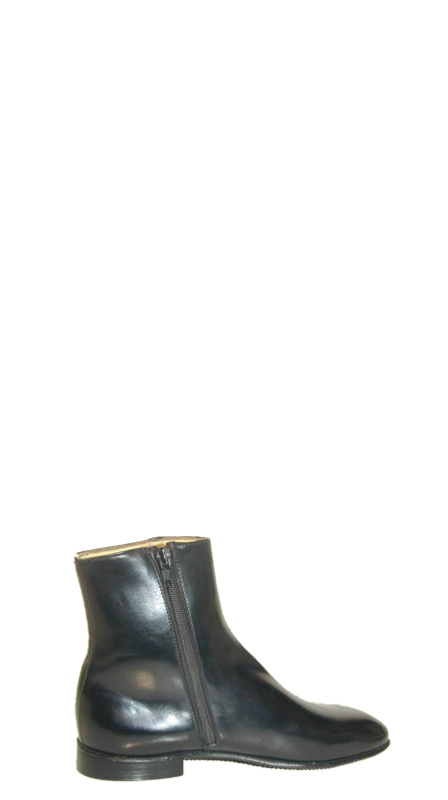 A zip on the inside is only sensible in ankle boots or City boots , which are not used for riding. 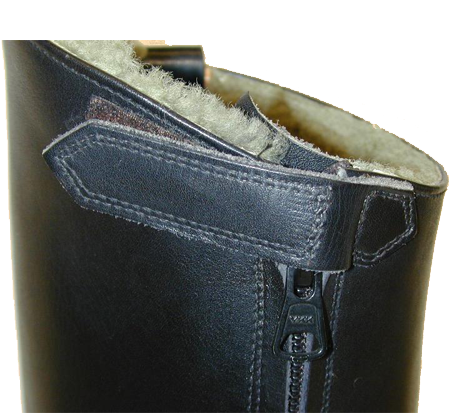 If you are often out in damp terrain, you should only choose a 3/4 length zip - it is true that getting into the boot will be more difficult, but it prevents water from ingressing. Instep lacing The instep lacing makes it easier for the riding boot to be put on in the area of the instep. Instep lacing is particularly suited if you have a high instep or problems in the ankle joint. It is, however, also often chosen as a purely visual accessory. The length of the lacing is also an optional choice. Instep lacing up to the knee is our Retro style of the classic polo boot. As an option, the colour and type of leather for the counter can be chosen by you. 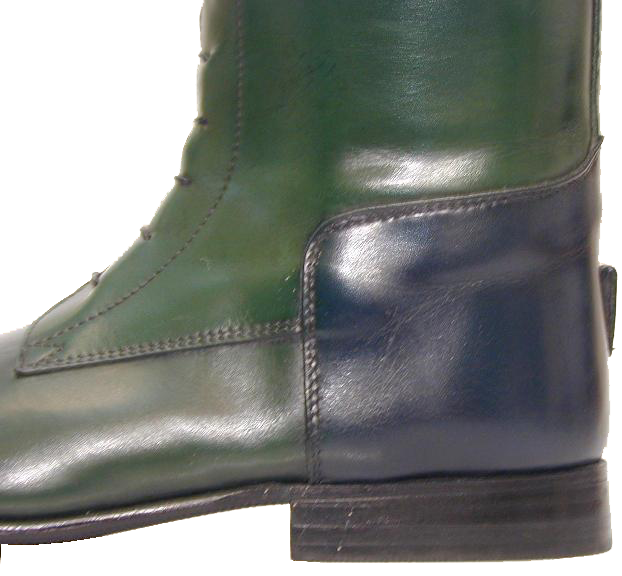 Toe cap and counter in the same colour present a co-ordinated image, independent of a different main shoe colour, and brightly combined colours are, above all, very popular for City boots. If you should have any questions about individual colour combinations, we will gladly advise you by telephone. Almost all shoes, boots and ankle boots can be ordered additionally with sewn-on toe caps in different designs. All types of leather and colours can be chosen and combined with one another. 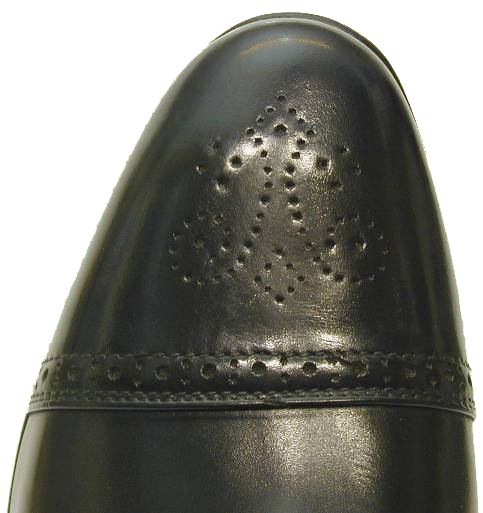 In addition, you can choose a toe cap with a fine or coarse perforation. A Lyra strip at the top of the toe cap is, likewise, available as an optional extra. 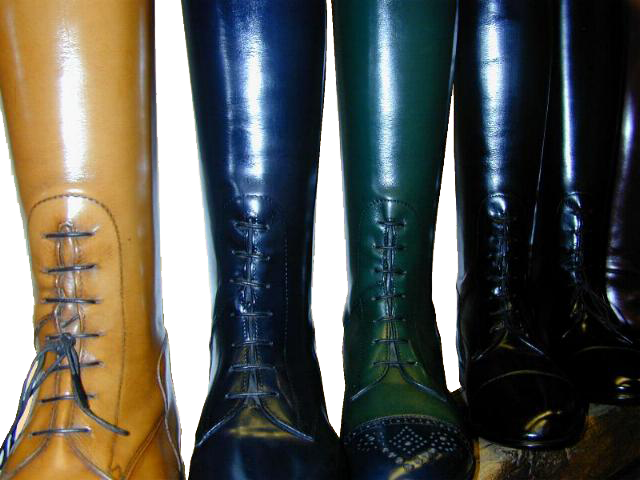 We can make boot tops for you in all colours, either as decoration, for instance in show jumping or hunting boots, or as subsequent lengthening of the leg as, for example, in the case of young riders, giving the boots extended life. 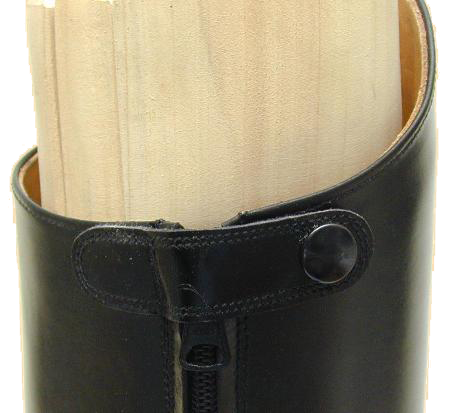 Hunting straps serve as decoration on boot tops, but they are also very popular in boots without tops. It is, of course, possible to make hunting straps in all the colours on offer. Whether the hunting straps are fixed (sewn-on) at their lower end, or not, depends entirely on your taste. 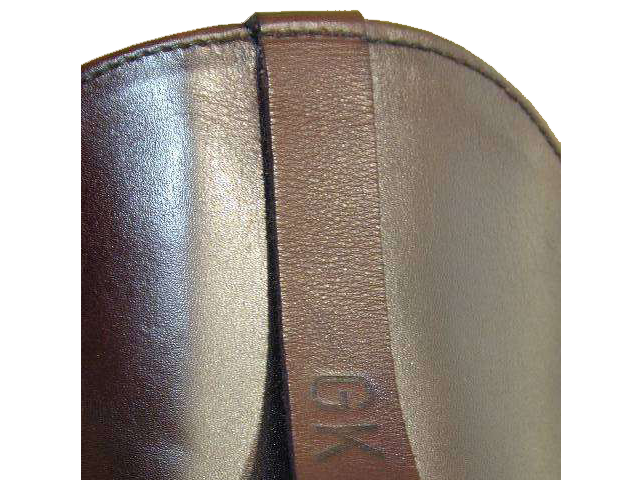 If you so wish, you can personalize your boots by having your initials on the hunting straps. 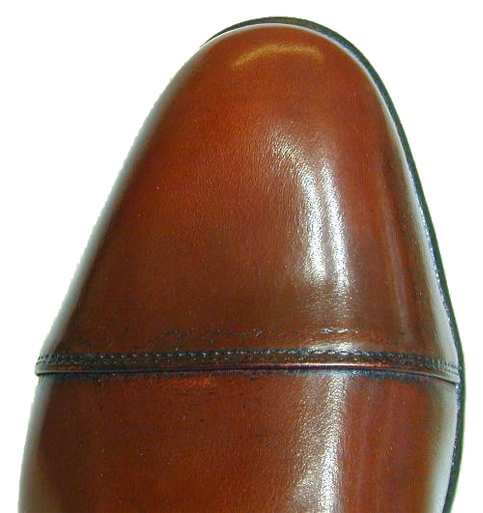 Your personal taste and the purpose of the boot play a significant role in the choice of sole type. 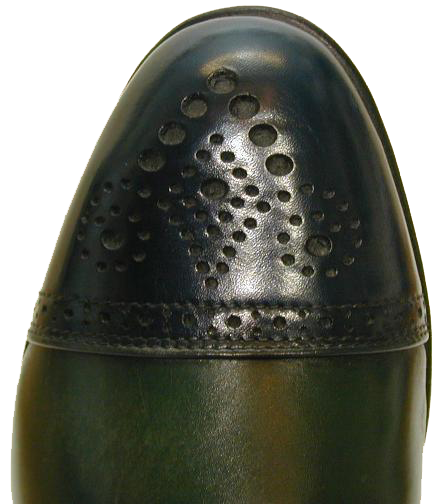 We recommend a light Ago sole with a thin, protective rubber solefor an elegant ladies boot. 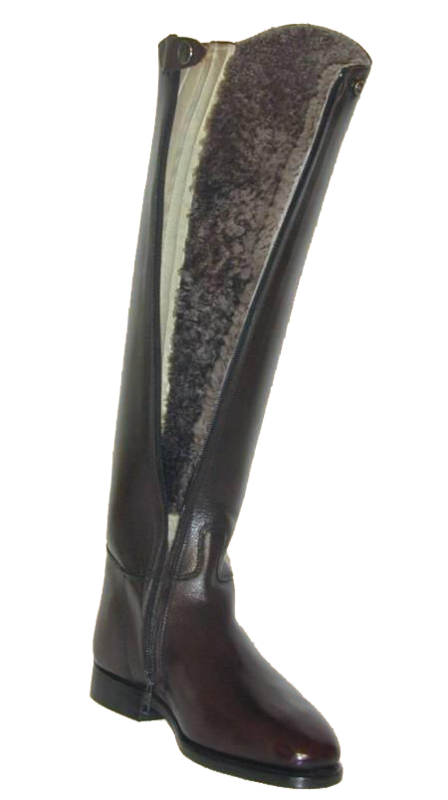 We recommend an Ago sole with a stronger but soft and elastic, ribbed rubber sole for a show jumping boot. 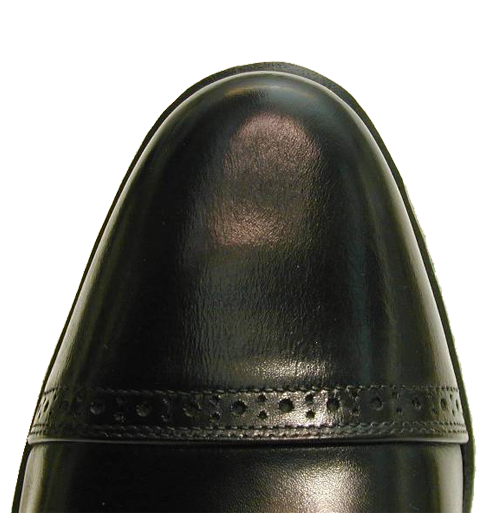 We recommend a welted sole for an elegant dressage boot for men. 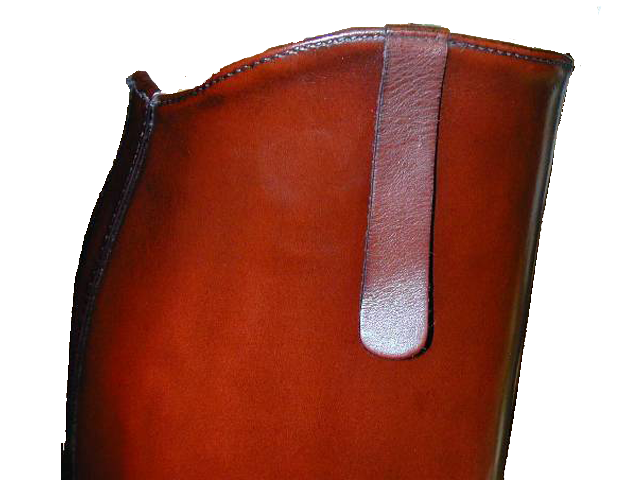 Welted shoes and boots have a leather top sole which could possibly slip in a damp stirrup. To avoid this, we also offer you here a thin, protective rubber sole or a stronger, protective sole, if you also walk a lot in your boots, or a soft and elastic rubber sole, if you are out a lot in bad weather. 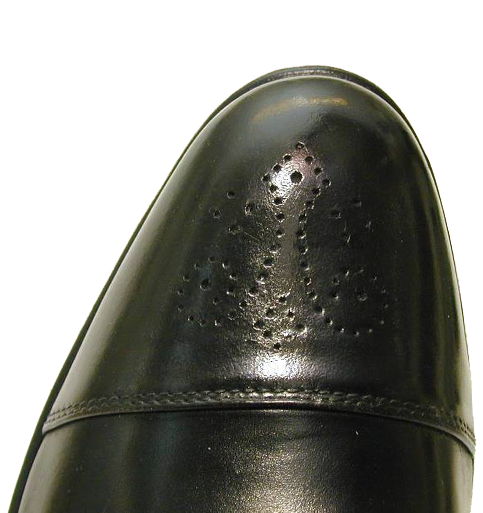 We recommend a sole with inverted seam for hunting and polo boots, which gives them a robust appearance. 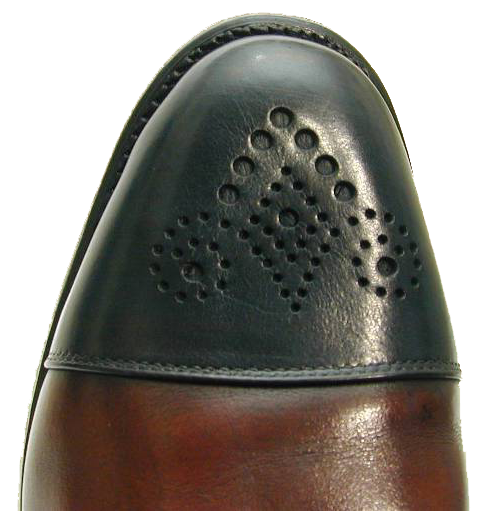 They, likewise, have a leather top sole, so that exactly the same question might arise, where applicable, about which rubber sole is suitable, as with the welted sole. We recommend a light but, likewise very hard-wearing Poro sole for all those who want to use their boots for mucking out or who often stand in the mud. The combination of the Poro sole and the waterproof or oil tanned leather results in an almost waterproof boot, bootee or half-boot. If there is too big a difference between the boot top and the boot top measurement we recommend a small, covered elastic strap, which offers you a simpler opening and a more elegant design. If you wish, these can be attached and they effectively prevent the spur from slipping down. As an option we can supply zips with one of our safety fasteners, to effectively prevent accidental opening of the zip.